Glossator also publishes book-length works of commentary. Ann Hassan. Annotations to Geoffrey Hill’s Speech! Speech! Brooklyn, NY: Glossator/punctum, 2012. 282 pages. ISBN-13: 978-1468129847. 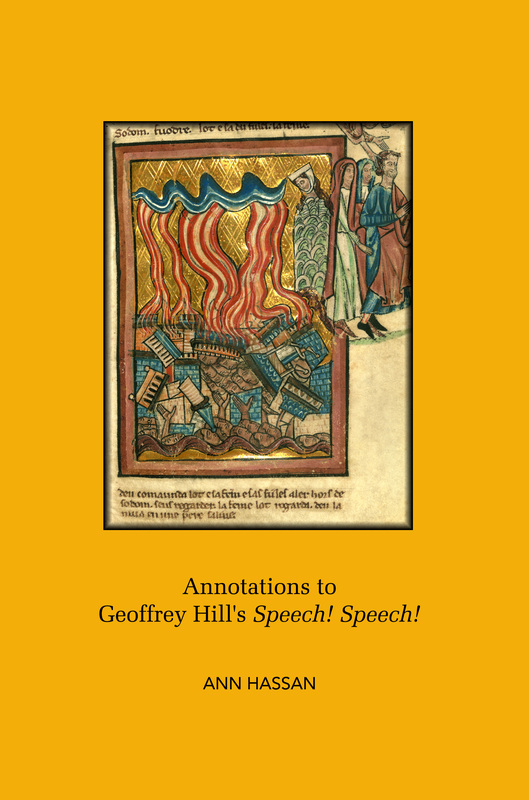 Geoffrey Hill’s Speech! Speech! (2000) encapsulates two thousand years’ worth of utterances in a symbolic act of remembrance and expression of despair for the current age, in which we find “our minds and ears fouled by degraded public speech—by media hype, insipid sermons, hollow political rhetoric, and the ritual misuse of words.” Through 120 densely allusive stanzas—“As many as the days that were | of SODOM”—the poem wrestles this condition from within, fighting fire with fire in an alchemical symbolic labour that transmutes the dross of corrupt and clichéd idiom into a dynamic logopoeia which proves true Hill’s persistent claim: “genuinely difficult art is truly democratic.” Such is the weird, ambivalently hostile position of poetry in the present world and thus the space of our real connection to it: “Whatever strange relationship we have with the poem, it is not one of enjoyment. It is more like being brushed past, or aside, by an alien being” (Hill). Befriending this estrangement, embracing it as a more amicable brushing-up-against, Hassan’s Annotations is a thorough and patient explication of Speech! Speech! that both clarifies and deepens the poem’s difficulties, illuminating its polyphonic language and careening discursive movement. The author’s method is at once commentarial, descriptive, and narratorial, staying faithfully with the poem and following its complex verbal and logical turns. The book generously provides, rather than direct interpretative incursion, a more durable and productive document of “the true nature / of this achievement” (stanza 92), a capacious, open understanding of the text that will prove invaluable to its present and future readers. Available in PDF and in print via Amazon and other sellers.